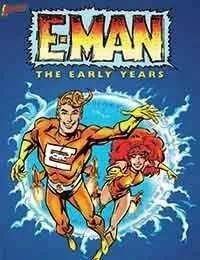 The beautifully re-colored collection of Nic Cuti and Joe Statons entire 10-issue E-Man run at Charlton Comics. Bonus materials include pieces done for Charlton Bullseye and original First Comics Michael Mauser/E-Man reprint covers. A gorgeous and fun collection; all reprint collections should be done so well!